You are currently browsing the category archive for the ‘herbs’ category. 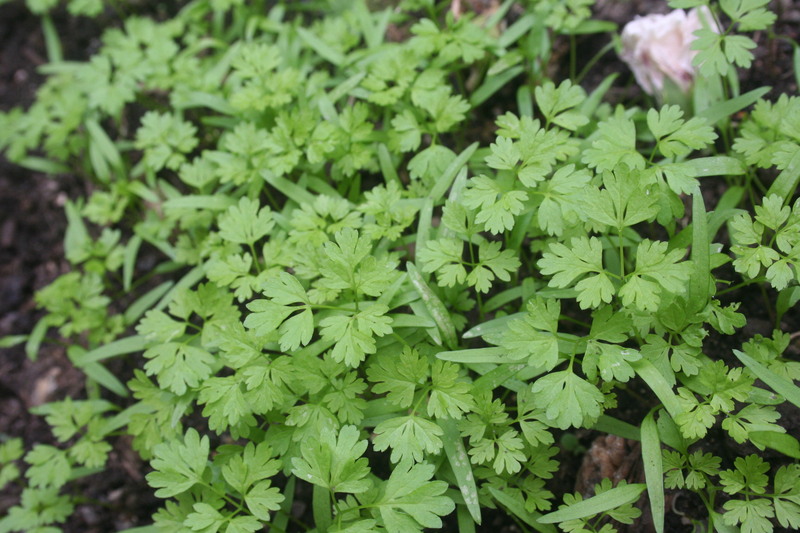 This spring’s chervil seed grew to big frothy plants in no time, then flamed out — hardly a chance to decide whether I liked the stuff. Just twice I harvested a handful and minced the delicate leaves into scrambled eggs, the second time gussied up with chopped smoked salmon, as per Jerry Traunfeld. Well. Jury was out on whether to grow this one again — it’s got a licorishy bite that didn’t do much for me, at least with eggs. So the plants went to seed and dried up; I never got around to cleaning up after the party. And now thanks to last week’s hard rain, a new generation is up and growing in force. In spite of their numbers I’m afraid these little guys won’t make adulthood before the cold, wet, and dark brings them down — but still. I can respect an edible that thrives in spite of, or perhaps thanks to, a bit of benign neglect. So if chervil wants to grow in our garden unprompted, okay. I’m thinking it won’t be too much of a stretch to find ways to cook with and enjoy it. 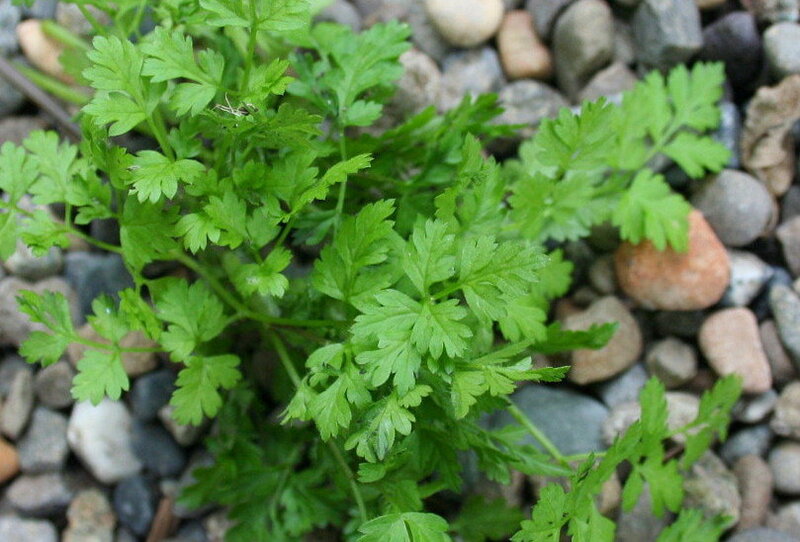 What are your favorite partners for chervil? I’m pleased to report that basil is looking sort of respectable lately. Something I heart about growing basil is that once the little plants are up and going, you’ll have a guaranteed supply through fall so long as you pinch back the tops every now and again. So easy. Pinching prevents the plant from flowering and going to seed (which robs the leaves of their flavor and lovely aroma), and thus causes plants to grow bushier and leafier. Which means pesto now and pesto all winter if you’re diligent. 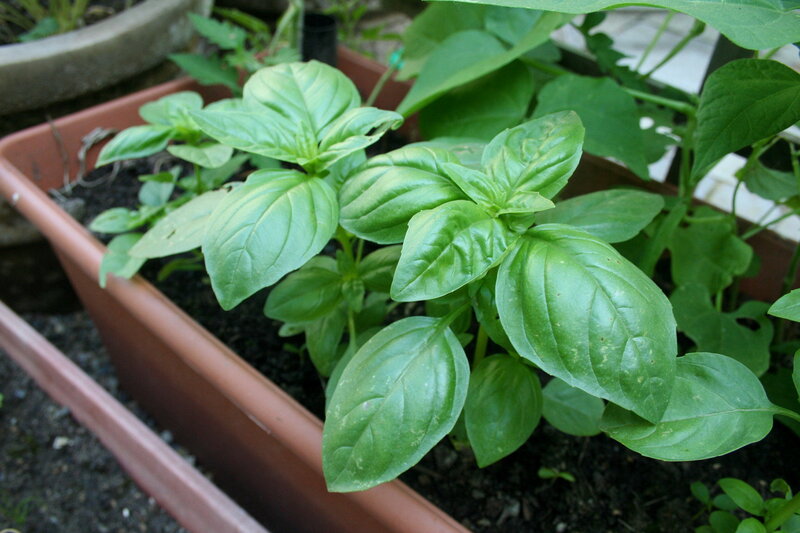 What’s your favorite use for garden basil? Is it just me, or is mint taking over the world? It grows wild behind the pea patch, and I’m forever ripping the burly runners out of the food bank beds. The strategy is containment, not eradication. 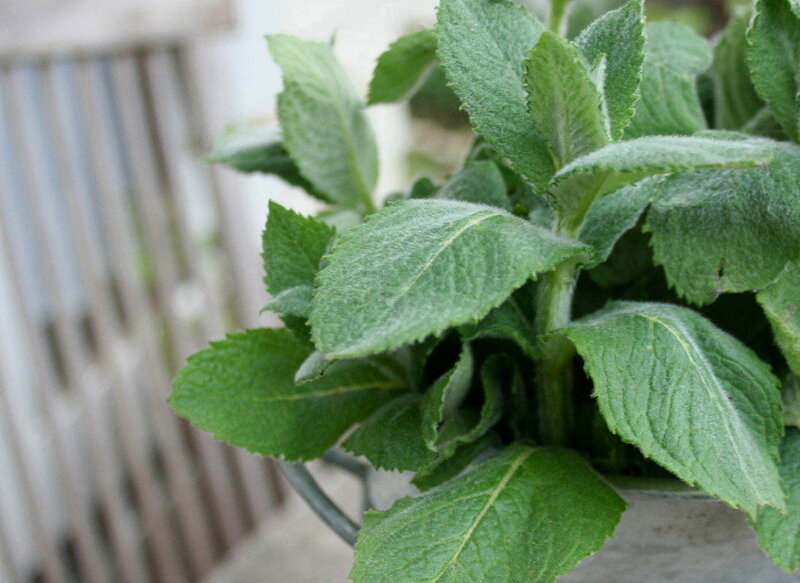 And think long and hard before throwing mint stems into the home compost, especially if your pile doesn’t get overly hot. Not that mint is the enemy. Not at all. 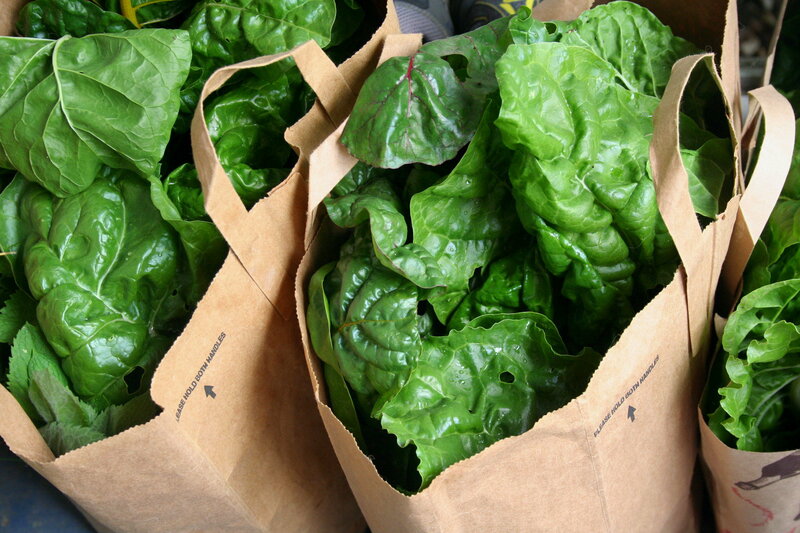 It can be so versatile in the kitchen, almost like basil the way it can go savory or sweet. 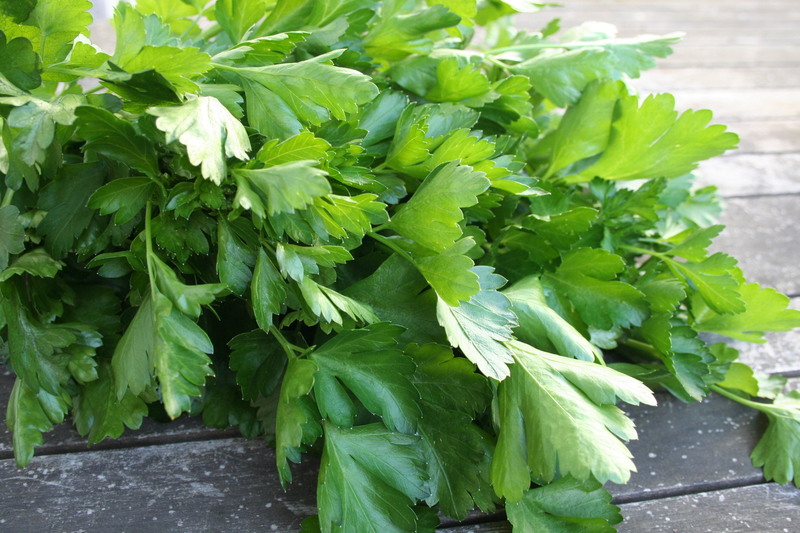 I like chopping it into a garlicky yogurt sauce to go with pan roasted lamb chops or grilled eggplant; thin slices are nice for Vietnamese cucumber salads and tabbouleh. Even the picky Biscuit likes to chew on mint, and she can happily entertain herself with a sprig while I chop soil and pull weeds. For a few minutes, at least, which is good as it gets these days. Indeed. First week in May, and even if you don’t care much about race horses, you can still enjoy a refreshing beverage with crushed mint and delicious alcohol. Only the mint is truly local in this drink, so if food miles are a concern, make up for it by using lots of the stuff. Muddle mint and lime juice in cocktail shaker. Add simple syrup, rum, bitters, and ice, and shake until chilly. Strain into two cocktail glasses and add half of the Champagne to each. *Make simple syrup from 1 cup sugar dissolved over heat into 1 cup water. For once we’ve got a lush dill crop, the key apparently being that clever combination of good sunlight and good drainage. Only problem has been a lack of garden partners, so for most of the season we’ve been chopping the herb into piccata sauces — simple amalgams of lemon, butter, and dill served over sauteed chicken breasts or grilled fish, a throwback to Charlie’s New England childhood. That’s until this week, when the first cucumbers came ready, and just in time for dill to send up its yellow umbrels. So the overlap with cukes won’t be more than ten days or so, but still. It’s enough time for tasty cucumber salads dressed with this easy dill-yogurt sauce adapted from the incomparable Deborah Madison. The sauce is also terrific with fried rounds of eggplant, available now at the farmers market. A couple of tricks here in your prep. First is to drain the yogurt of whey using a fine-mesh strainer, which yields a thickened yogurt ‘cheese’ — I find that homemade yogurt releases a fair quantity of whey, and straining firms things considerably. Alternately opt for a store brand like Nancy’s Organic Yogurt, which comes almost as thick as the Greek stuff, which gains body from pre-drainage. Second trick is to pound the garlic to a pulp with a bit of salt, which mellows the flavor and diffuses it more evenly through the sauce. Drain yogurt in a fine mesh strainer until fairly firm, about 30 minutes. Pound garlic with salt and add to yogurt when yogurt is fully drained. Stir in dill and cayenne, correct for salt, and chill for 30 minutes before serving tossed with sliced cucumbers, tomatoes, and feta, or atop fried eggplant. Makes ½ cup. It’s best on the day it’s prepared. Blend ingredients in a food processor or blender until (mostly) smooth. I ended up using walnuts in this recipe because there were no pine nuts or cashews in the house. Serve with pasta. After dinner, we freeze the remaining pesto sauce in an ice cube tray to preserve it in single-serving units. The information superhighway is packed with claims of how easy it is to make scallion pancakes, a Chinese street vendor food. Not so fast. What’s easy are pa jun, the eggy Korean pancakes with minced alliums or vegetables added to the batter. Pa jun are similar to crepes and can be made in a matter of minutes — perfect when you suddenly find yourself in need of something hot, fried, and salty. Check out the New York Times’ recipe for details. Mix flour and salt in a deep bowel then add water slowly, incorporating with a wooden spoon until the ingredients come together loosely. You may not need all of the water. Knead the dough into a ball, 1-2 minutes, then cover with a damp towel and rest for ½ hour. Divide the dough into 4 portions. On a floured surface, roll each portion into a very thin square. Spread 1 tsp sesame oil across the rolled dough with your fingers. Sprinkle oiled surface with chives. Beginning at one edge, roll up the dough like you are rolling up carpet. This should make a rope of dough. Gently twist the rope a few times. Then, starting at one end, coil the dough in a circle, forming something like a cinnamon roll. Repeat with remaining portions of dough, and cover coiled dough with the damp towel and rest another ½ hour. Heat a heavy skillet over medium high heat. Add vegetable oil when pan is nearly smoking. Lightly flatten the dough with a rolling pin into a pancake shape, taking care not to press out all of the air bubbles so the dough becomes completely flat. Place pancake in pan when oil is shimmering and cook 2-3 minutes per side, until browned and dough is slightly puffy. Cut into 8 triangular pieces and serve immediately with a dipping sauce made from 3 tbls soy sauce, 3 tbls water, 1 tsp rice vinegar, and sambal oelek to taste. Feeds 4 as an appetizer. Closer inspection of the herb garden revealed that not only were chives up and kicking, but a flush of tarragon buds have broken through the ground and last year’s marjoram plant — an annual, to my knowledge — is sprouting green growth at the crown. Which means that it’s barely Februrary and I’m behind in the garden. Already. Good thing the perennials more or less take care of themselves. Now to figure out the year’s flower and vegetable plantings.